This Jungle theme 4-feature challenge is jam-packed with fun, offering a generous area of jumping area, basketball hoop, climb up to a fun and fast slide, For both indoor and outdoor use, meets ASTM standards and comes standard with Ninja Jump's 15 oz. lite n' strong & trade; fire resistant vinyl. High-visibility mesh around all sides allows spectators to view easily. **includes 4 stakes and 1 blower. 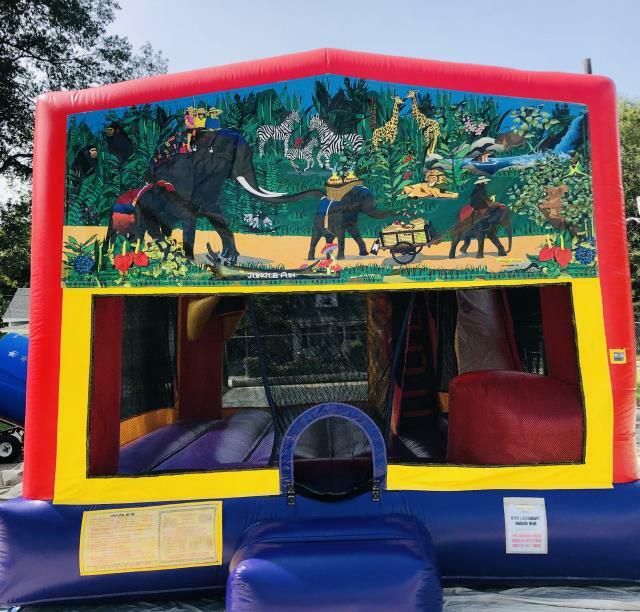 * Please call us for any questions on our jungle fun wet/dry/slide/bouncer combo rentals in Rocky Mount and Wilson NC.